“Endless Possibilities” is what Westside stands for and here comes another surprise for our consumers- Westside Insta gifts!!! 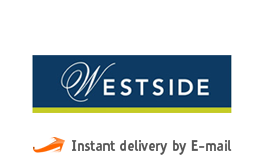 Now if you forget your wife’s birthday gift or your best friend’s anniversary gift- take a deep breath….here’s Westside E-Gift cards that can be immediately mailed to your associate, friends or family members. They can show the E-Gift card at the store and redeem it against any product of their choice. Instant Gifting, endless experiences!!! 2. Period of Validity:1 year from date of issue. 4. The e-gift card is Non-reloadable. 5. This e-gift card needs to be used in full. In case the value of the merchandise exceeds the value of e-gift card, the difference shall be paid by the bearer. No refunds / credit note shall be issued for unused part of the e-gift card. 6. Redeemable during End of Season Sales, Promotions & Offers. 7. Accepted at Gourmet West (Food Section). 8. This e-gift card cannot be exchanged for Cash/Gift Cards/Credit Notes. 9. Protect the e-gift card number and PIN to avoid misuse. Trent shall not assume any liability in case the card PIN gets stolen/compromised, Trent shall neither replace the e-gift card nor refund cash. 10. Only valid e-gift card would be accepted. 11. Any disputes/s shall be subject to the jurisdiction of the courts in Mumbai. 12. Trent Limited reserves the right to amend the Terms & Conditions at its discretion without prior notice. 13. This card is the property of TRENT LIMITED. 14. Please refer to www.mywestside.com for more important Terms & Conditions.